Communication is really hard! No, seriously! So, we knew already that communication is hard. Nothing new there, but here's a few insights into why, the so called Wiio's laws. Sobering observation! Now, wouldn't you wish you had talked to that developer yesterday instead of sending him that e-mail? You would have avoided a lot of problems today, wouldn't you? I bet anyone in my position (Agile Coach) has faced this before: you present a work method to a team or a person (be it scrum, XP, DSDM, FDD, etc.) and they go "yeah, I see what you mean, but that would never work here". If I only had a dime for every time I heard that I could be rich! Today it happen again. Here I am presenting the Personal Scrum work method. People are following, they are asking some good questions and at some point it hits: "Yeah, I see what you mean and it makes sense, but that would never work for us. We have too much work we cannot predict because we want to have a very fast turnaround for our customers (1 business day) and that's why we cannot really plan our weeks that way. On top of it we are too busy to spend that much time (1-2 hours/week) planning what to do." If you cannot allocate your whole week because some portion of it will be "unpredictable" (have you heard of maintenance in production software?) then you don't allocate the full week to planned work! That's not a reason not to plan... Just estimate how much time you need for "unexpected" items (and that tends to be pretty regular from week to week), and plan the rest of the time! If you are too busy, then how do you know your are doing the most important things for your stakeholders/customers? Are you setting aside the time to think through the priorities of your work from your customer/stakeholder's perspective? If not then I'm sure they'll be mad at you or at least disappointed -- even if you are busy! If you are too busy (yes, again), that means you are "thrashing". This means: you have started many threads of work but are getting none of it done! Remember that only work that is "done" counts. Starting something you don't finish does not count (unless your manager/supervisor is clueless, in which case it is time to search for a new job anyway). Search for the ZEN of getting things to "done". Work is work. Stating that a method (whatever that method is, take GTD for example) does not apply to manage your work can only be a result of not understanding the basic essence of any piece of work: 1) you get an order with some information and possibly inputs; 2) then you process it, alone or with a team; 3) finally you finish the work (as in "done"). This is true for every piece of work that needs to get done, whether it is planting potatoes or designing a piece of software, and certainly writing a business proposal or answering an RFP. If you don't understand that basic attribute of work there's a deeper problem we need to address. Managing the work is the least of my worries when I face this type of situation. In the CSM training, after the "promise" game exercise he was looking down and gloomy. I walked up to him and asked what was the matter. He turned and said: "see, this (the problems uncovered by the "promise" game) is what I see in all companies I visit, and that just makes me feel sad about the state of our industry. See, what I'm trying to do is just make our industry better, more professional". Indeed, better and more professional. That's the right goal! So Personal Scrum is not that new. That does not surprise me as it seems to be such a good process for managing any work that, in my view, approaches a basic Pattern in work/tasks/time management. In the spirit of Lean my colleague and friend Mika Pehkonen writes how they are able to respect people, get them to do what they are best at and most motived to do. I'd say that's a win-win-win situation! we pay our translators by the hour, not by word count. This means that the translator gets fair pay for their work, they do not need to spend time on proofing computer propagated translation matches that are by default out of context and they get to concentrate on their key expertise, translating concepts from one language and culture to the other. This, combined with assisting scripts and tools, allows the translator more ownership over their own work in ways that are more meaningful than just reviewing and translating words in a software. Just after writing the post about about Never ending design discussions I found one post from Lasse about story points. I think these two posts go very well together, as story point-based estimations is what I use for the Timeboxed estimation pattern. In this post, Jason explains one common problem with the estimation and planning sessions in Agile teams. The problem he describes however, is quite common and has lead to implementation of the Separate Design and Requirements anti-pattern in the traditional software development world. So I thought I'd write a pattern about a simple and common solution that I've seen and applied to solve that problem. 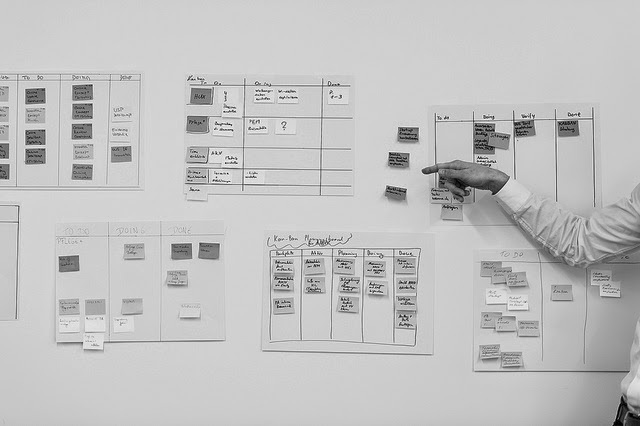 In the first part of the planning meeting the Scrum team and the Product Owner will review the top User Stories in the backlog to make sure the team and the Product Owner share the same understanding of each User Story. In the second part of the planning meeting the team will do a short design discussion for each of the items. The discussion should be around what needs to get done for each User Story in order to collect Meaningful Tasks and make the work clear to the whole team. When the team gets to the definition of meaningful tasks they will get stuck in design discussions often spending too much time in the first one or two stories and then not having a complete decomposition of the other User Stories that would organize the sprint for the team. This pattern is applicable in the context of the planning meeting, but can be used also when reviewing a Product Backlog before the planning meeting (see Prepared Product Backlog). The same pattern can be used to estimate any attribute of a task, such as effort, risk or business value. In order for this pattern to be applied the team needs to agree to use the same technique. Sometimes some of the team members will refuse to use this practice by stating that it is not "serious" enough or challenging it's credibility. Alternatively people can say that with this method we cannot get "good" design, however it is important to point out that the aim of the planning meeting is not to set the "final" design, but rather the first iteration of the design and especially to achieve consensus with the team on the design patterns and architectural approaches selected. The design, as well as the product, should evolve during the sprint. In my experience this technique can be successfully used in teams of up to 10 people during the planning meeting. The solution is to time-box the estimation for every single User Story, not just for the meeting. Note that the team needs to agree how much time they will spend for each item they accepted for the sprint that is starting. We have used 5 minute time boxes for development stories and 2 minutes for management-related stories. At the start of the meeting the team agrees on the size of the time box in such a way that it allows to cover all the stories needed within the length of the meeting. For example, if you have 10 stories to cover and 60 minutes meeting that means that after 5 minutes you need to move to the next story (that will give you a 10 minute buffer). Example questions are: what modules will this story touch? ; do we need help from any other team? ; do we already have module X in our version control? ; do we have the design for the UI? ; will we need to manually test this feature or is it enough to have the automated user acceptance tests? ; etc. For some tasks to be clear, the facilitator may need to ask clarifying questions. See step 2 for examples. At 4 minutes (if the timebox is 5 minutes), the facilitator will request everybody to estimate the story (using the Planning Poker method for example). At this time the facilitator can focus the discussion by asking the highest and lowest estimate person: "Why do you think that is the case?" The facilitator closes the estimation for this story. Return to step 1. After the meeting the team has a preliminary list of tasks (that will be improved during the sprint) and a consensus on some basic, yet critical design/architectural decisions. Even if this method seems "minimalist", our experience is that it works well-enough even for 4 week sprints. Although, due to the size of the tasks it is easier to apply to 2 week sprints. The first few times the team will try this technique their discussion may be very superficial, especially if the team has never had design discussions in short spurts before. This is to be expected and the experienced ScrumMaster will keep her ears open for symptoms of this during the daily meetings and call for additional design discussions during the sprint, when needed. The first few times the team may feel that the process is "artificially" strict. This is a common critique. However the team should stick to the practice for at least 4 sprints before changing it or "customizing" it. Our experience is that people will adapt to the method and, after some sprints, start producing high-quality high-level design already during the short discussions in the planning meeting. If the first part of the planning meeting was not enough to clarify the aim of each of the stories to be estimated the team may have to discuss the stories from the requirements perspective before they can have a design conversation. In this case the facilitator should stop the discussion and defer the estimation of that task to when the Product Owner has explained well enough the story (this is the Unclear Stories anti-pattern). Jason suggests that projects, in his experience, face similar problems (I'm assuming he is talking about all projects, including Agile projects). What is your experience? What are the mistakes that happen all the time as Jason suggests? In the waterfall world one of my favorites that happened all the time was: requirements change constantly. Can you imagine a world where requirements changes were a bad thing? I can't. I guess i've been exposed to Agile for too long (wink, wink). Being in Finland I'd love for Nokia to continue to be a big player in the mobile phone and mobile Internet access market. I lover their N810 device (just don't get why they did not put a GSM chip in it...), and have been a loyal customer of their mobile phones. What does your shell history say about you? "cd" and "ls" are a waste of time... Something to improve here. This is a pattern that effectively prevents any team from succeeding, and in many cases just causes a whole organization to behave in a dysfunctional way. Check it out. Has it happened to ? No, honestly! Don't blame, reward people that surface their own mistakes! In Lean thinking errors or mistakes are seen as opportunity for improvement and growth. But in lean, mistakes don't come alone, they also provide an opportunity for the team to create a poka-yoke tool/device. Poka-yoke stands for "mistake proofing", i.e. making sure the same mistake does not happen again. This can only be done by changing the process or tools. All of these things stem from the most important value in Lean Thinking: Respect for people. When Toyota started exporting their ideas outside Japan they found out that in some countries the culture was to "blame", not to reward the honesty of admitting a mistake. There's this story (thanks for the link Jukka!) of an american enginner (let's call him Mike) working in Japan. Mike was working on the line and while assembling a part in the car he scratched the paint. Influenced by his culture he was afraid of admitting the mistake, so he thought twice before pulling the andon cord (the device that notifies others when there is a problem). After a few seconds of struggling with the dilemma he pulled the cord and waited. The team leader immediately came to the workstation and was able to fix the defect quickly. The line did not stop. At the end of the day while the daily meeting was going on the team had brief exchange in Japanese that Mike did not understand, but his fear was that they were just criticizing him in Japanese so that he would not feel so bad. He was wrong. Soon after that the team started applauding and looking at Mike, he was confused. When asked, the supervisor clarified: "the team was proud of you admitting the mistake and wanted to express that!". This is why mistakes should be "admitted" by those who make them, not just "blamed on" the people that made them. Admitting the mistake and wanting to improve based on the learning is the most important part of surfacing the mistakes and "stopping and fixing". A culture that only assigns blame for mistakes will only create a need to hide those mistakes. Let people admit their mistakes and create a welcoming environment where people actually will be proud of surfacing and fixing their mistakes. Don't just blame, blame kills improvement. Update: Updated to add link to the story about Toyota. So, I've been inflicting Scrum on myself. This is my "eat your own dog food" because I'm an Agile Coach at the company where I work, which in practice means that I try to work with teams and help them with Agile adoption, and in some cases with the Agile development. For me to preach Scrum and not do it would be at least incoherent, but I can think of even less nice ways to put it. So, back to the story. I'm using Scrum patterns for managing my own work. Let me explain this a little bit. I'm following a method for the management of my personal work that resembles and is largely based on the patterns that we see in Scrum. I have the weekly planning (yes, I'm using weekly iterations/sprints) every week on Monday morning. This is where I look at my backlog (personal and team) and the list of meetings for the week and I plan what I will be doing that week. The weekly plan I put on the wall with post-its. On Friday I finalize my sprint, do the personal retrospective and review if there's something from that retrospective that I want to add to my Backlog. There are more details to this, but these are the key points. I'll write about the details later. The daily check (point 2), which is my review of the task board in the morning and the resulting "daily plan"
The retrospective (point 3). Where I analyze my work week and collect "TRY" items (as in Cockburn's retrospective agenda) that I will implement during next week. This way I stay familiar with the mechanics of Scrum (not all, but the key points) and have a method for managing my own personal work. The results have been good. I've developed the concept of personal capacity (velocity in XP), which tells me what I can commit to and gives me a good way to communicate with my stakeholders about what I can and cannot accomplish in one week of work. As a result of knowing my capacity I can now be proactive and manage the "pipe" of work for the next few weeks (I'm keeping a backlog of three weeks for short term actions in a limited queue: credit for Mary Poppendieck for bringing that up in the training at our company). Maintaining the limited queue for the next 3 weeks in turn helps me not just avoid over committing to work during the ongoing week, but hopefully also for the next three weeks. The biggest value I get out of the system though, is that now I really am in control of my work and can make informed decisions constantly. I have a proper time management system in place! This method I call Personal Scrum, when used to manage my personal work, or Management (as in Work Management) Scrum, when used to manage the work of a management team.